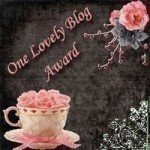 I am very happy to receive this lovely blog award from Pavithra, the one who is in the process of making Kitchen Revolutions ;) Or thats how I kid about her. Thank You Pavi.. Also like to extend my Congrats to Vrindha, Pooja, Kitty, Pinky for their awards.. They say it has to be passed on to another 10 bloggers who deserve..
Kalai, Varsha, Hari Chandana, Shilpa , Lata Raja Many of these bloggers are in the blog world for quite long and am sure they would have come across this award, still I would like to share it with them. Those are few of the blogs I really enjoy ! Congratulations Sowmya ! we both received our first awards from pavithra ! thats a coincidence ! Congrats on your first award Sowmya and thank you for sharing it with me. Congrats on ur first award Sowmya,keep up the good work..
Hey Sowmya ,Congrats on the award!!! so cute! U deserve it dear..thnx! Congrats on the award gal..
Congratulations on your award, Sowmya. Thanks so much for thinking about me. You made my day!! Hey, why THANK YOU Sowmya.That is very thoughtful of you.I really appreciate that. Thanks a lot sowmya ...and congrats to you too..
Congrats Sowmya, Thank you for condidering me.